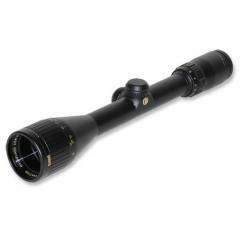 Bushnell 324120B Elite 3200 4-12x40 DOA 600 Reticle Riflescope 324120B FREE SHIPPING! The Bushnell Elite 3200 is a premium variable-power riflescope designed for all-weather hunting performance. Its one-piece, hammer-forged aluminum tube is tested for extreme recoil resistance, and filled with nitrogen for total waterproofing. A hydrophobic Rainguard HD coating on the external lens surfaces breaks up water droplets, reducing light scatter for enhanced clarity and reduced glare. The multi-coated optics maximize light transmission while preserving color fidelity, giving you a bright, clear and detailed image.The adjustable objective enhances accuracy at all distances, and features resettable click windage and elevation controls for making extremely precise shots. It also features parallax adjustment from 10 yards to infinity, providing enhanced accuracy at long distances. ©2002-2019 CopsPlus.com: Bushnell 324120B Elite 3200 4-12x40 DOA 600 Reticle Riflescope 324120B FREE SHIPPING!